Audio can be heard from the vehicle's speakers by connecting a commercially available portable audio unit to the auxiliary jack. A commercially-available, non-impedance (3.5 ) stereo mini plug cable is required. ●Always close the auxiliary jack/ USB port lid when it is not in use. If foreign matter or liquid penetrates the auxiliary jack/USB port, it may cause a malfunction. 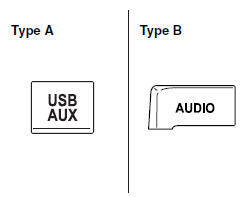 • Before using the auxiliary jack/USB port, refer to the instruction manual for the portable audio device. • Use a commercially-available, nonimpedance (3.5 ) stereo mini plug for connecting the portable audio unit to the auxiliary jack. 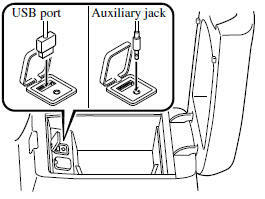 Before using the auxiliary jack, read the manufacturer's instructions for connecting a portable audio unit to the auxiliary jack. • To prevent discharging of the battery, do not use the auxiliary input for long periods with the engine off or idling. • When connecting a device to the auxiliary jack or USB port, noise may occur depending on the connected device. If the device is connected to the vehicle's accessory socket, the noise can be reduced by unplugging it from the accessory socket. 1. Open the console lid. 2. Open the auxiliary jack/USB port lid. 3. Connect the device plug to the USB port. 3. Pass the connection plug cord through the cutout of the console and insert the plug into the auxiliary jack. Do not place objects or apply force to the auxiliary jack with the plug connected. • Insert the plug to the auxiliary jack/USB port securely. • Insert or pull out the plug with the plug perpendicular to the auxiliary jack/USB port hole. • Insert or remove the plug by holding its base. 2. Press the power/volume dial to turn the audio system on. audio unit to change to the AUX mode. 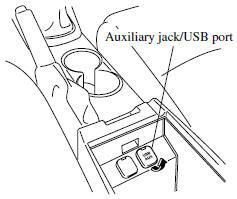 • When the device is not connected to the auxiliary jack, the mode does not switch to the AUX mode. • Set the volume of the portable audio unit to the maximum within the range that the sound does not become distorted, then adjust the volume using the power/volume dial of the audio unit or the up/down switch of the audio control switch. • Audio adjustments other than audio volume can only be done using the portable audio device. • If the connection plug is pulled out from the auxiliary jack while in AUX mode, noise may occur. to the USB mode and start playback. • When the USB memory is not connected, the mode does not switch to USB mode. • When there is no playable data in the USB memory, “NO CONTENTS” is indicated. • Playback of the USB memory is in the order of the folder numbers. Folders which have no MP3/WMA/AAC files are skipped. • Do not remove the USB memory while in the USB mode. The data may be damaged. This function scans the titles in a folder currently being played and plays ten seconds of each song to aid you in finding a song you want to listen to. Press the repeat button (1) during playback to play the current track repeatedly. “TRACK RPT” is displayed during playback. Press the repeat button (1) two times while “TRACK RPT” is displayed to cancel. Press the repeat button (1) two times during playback to repeat the playback of the songs in the current folder. “FOLDER RPT” is displayed during playback. Press the repeat button (1) while “FOLDER RPT” is displayed to cancel. Press the random button (2) two times while “FOLDER RDM” is displayed to cancel. Press the random button (2) two times during playback to play the songs in the USB memory randomly. “MEDIA RDM” is displayed during playback. Press the random button (2) while “MEDIA RDM” is displayed to cancel. • The information (artist name, music name) is displayed only when the USB memory information in the USB memory has information which can be displayed on the screen. When the message “CHECK USB” is displayed, it indicates that there is some error in the USB memory. Verify that the content recorded in the USB memory has MP3/WMA/AAC files and re-connect correctly. If the message reappears, have the unit checked by an Authorized Mazda Dealer. to USB mode and start playback. • When a USB memory is not connected to the USB port, the mode does not switch to the USB mode even if the on-screen tab is touched. • Do not remove the USB memory while in the USB mode. Otherwise, the data could be damaged. playback is paused to cancel the pause. or turn the file dial counterclockwise within a few seconds after playback begins to track down to the beginning of the previous track. or turn the file dial counterclockwise after a few seconds have elapsed to start playback from the beginning of the current track. 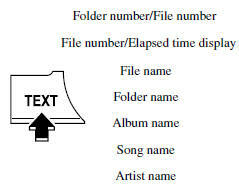 The optional file list in the USB memory can be viewed. the folder list in the USB memory. Touch the folder to display the file list. Select a desired file to play the song. touched, the folder list in the USB memory is displayed. playback to continue the playback from that point. playback. “ ” is displayed during playback. times while “ ” is displayed to cancel. when the whole title is not displayed. 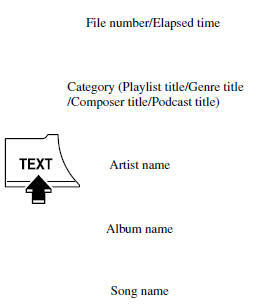 • The information (artist name, music name, album name) is displayed only when the USB memory has information which can be displayed on the screen. If the message “USB Error” is displayed, it indicates that there is no playable file in the USB memory or there is an error in the USB memory. Verify that the content recorded in the USB memory has MP3/ WMA/AAC files and re-connect correctly. If the message reappears, have the unit checked by an Authorized Mazda Dealer. switch to the iPod mode and start playback. • When an iPod is not connected, the mode does not switch to the iPod mode. • When there is no playable data in the iPod, “NO CONTENTS” is flashed. • Do not remove the iPod while in the iPod mode. Otherwise, the data could be damaged. or turn the file dial counterclockwise within a few seconds (depends on iPod software version) after playback begins to track down to the beginning of the previous track. or turn the file dial counterclockwise after a few seconds (depends on iPod software version) have elapsed to start playback from the beginning of the current track. Press the category down button (5) to select the previous category and press the category up button (6) to select the next category. select the previous list and press the list up button ( ) to select the next list. This function scans the titles in a list currently being played and plays 10 seconds of each song to aid you in finding a song you want to listen to. Press the repeat button (1) during playback to repeat the playback of the song in the current list. “TRACK RPT” is displayed during playback. Press the repeat button (1) while displaying “TRACK RPT” to cancel. Press the random button (2) during playback to play the tracks in the list randomly. “SONG RDM” is displayed during playback. Press the random button (2) two times while “SONG RDM” is displayed to cancel. Press the random button (2) two times during playback to play the songs in the iPod randomly. “ALBUM RDM” is displayed during playback. Press the random button (2) while “ALBUM RDM” is displayed to cancel. The track number being played randomly is in the order of the iPod shuffle table. • The information (artist name, music name) is displayed only when the iPod has information which can be displayed. 13 characters (Except file name) can be displayed at one time. To display the rest of the characters of a long title, press and hold the text button ( ). The display scrolls the next 13 characters. Press and hold the text button ( ) again after the last 13 characters have been displayed to return to the beginning of the title. If the message “CHECK iPod” is displayed, it indicates that there is a malfunction in the iPod. Verify that the content recorded in the iPod has playable files and connect correctly. If the message reappears, have the unit checked by an Authorized Mazda Dealer. to the iPod mode and start playback. while playback is paused to cancel the pause. a few seconds (depends on iPod software version) after playback begins to track down to the beginning of the previous track. a few seconds (depends on iPod software version) have elapsed to start playback from the beginning of the current track. The song list in the iPod can be viewed. The song list may not display depending on the conditions. 2. Touch the category which you want to select. The record list or song list is displayed. Press the on-screen button to display the upper list. Select the desired song to play. The selected song list becomes the play list. The track number being shuffle played is in the order of the iPod shuffle table. first character of the title. when no titles are displayed. • The information (artist name, music name) is displayed only when the iPod has information which can be displayed on the screen. 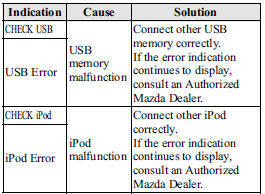 If the message “iPod Error” is displayed, it indicates that there are no playable files in the iPod or there is a malfunction. Verify that the content recorded in the iPod has playable files and re-connect correctly. If the message reappears, have the unit checked by an Authorized Mazda Dealer.